In mod manager, right click on wog mod to open plugins list. Still not working. But thanks. Maybe time can solve everything. Edited by Forsberg at 08:59, 21 Sep 2018. Thanks, it worked GUI is bigger now. Is there a script for caravans like in great Heroes 5? Yesterday I had 10 castles and wanted to bring all units to one for a final fight. Must have been recruiting new heroes as transporter... (except Call to Arms which is very basic). Sorry, no ready scripts, except Call to Arms, which I wrote for the same reason. Was tired of manual hiring. Reinforcement spells by Ivor. Hero can summon troops from all towns he owns with a new spell. Edited by TehAchilles at 23:45, 23 Sep 2018. Message: "Failed to create log file at "Debug/Era/log.txt". Probably another Heroes 3 instance is running"
Can anyone help? 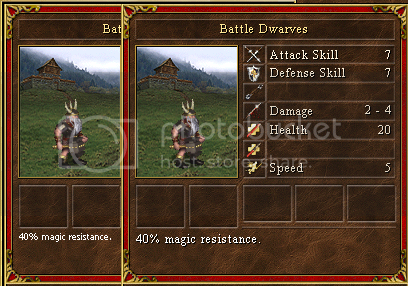 Would really love to play this, been a long time fan of HoMM games, with HoMM3 being my favorite like many others. Edited by igrik at 13:10, 24 Sep 2018. Create directory DebugEra in root heroes 3 directory. This small issue will be fixed in the next release, I'm working on. I don't understand any of this I'm afraid, but I hope someone might be able to help me out here. Seems strange, please install 2.7.6 temporarily over 2.7.7. I'm currently struggling with mods support for maps editor, cannot test. Edited by Orzie at 11:24, 02 Oct 2018. Actually, why don't you try using ERM? Given the ERM Help, an inexperienced user could easily get into this kind of stuff. P.S. If you create a separate thread for your work, it might get a little more views. Edited by Morglin at 13:45, 02 Oct 2018. I don't want to learn the whole ERM at this moment. I think that the most important is fix town screen issues, make script for special buildings abilities and for some creature abilities (proper script for schooting for sure). And knowledge why creature statistics don't display properly. If that will be done, I can replace rest of the graphics/sounds and do rest of works by hexadecimal editing. I was encountering the same problem btw. I was able to solve it by right clicking and go to Properties > Compatibility and set it to compatibility mode to Windows 8. Hope it works for you! I tried installing the 2.7.7 version on a Complete Edition from GoG and it didn't work, the same error as TehAchilles reported showed for me as well. But the installer from the link you provided did the trick. Hopefully there's a fix soon for the issue (I preferred installing it the old way, not sure if there's any significant difference). Edited by Hero_of_Light at 20:52, 12 Oct 2018. If so, why did you do that? The old one was just fine. The new one is smaller and not that good. Is there a way to change it back to normal? Also, my old campaigns saves do not work. Is that normal? Luckily I found an older version (2.46), though I would like to have a newer one. This worked for me, odd thing happened with v2.7.7 I can only get 1 other person playing it. If a 3rd person joins it always drops the 3rd person and trying a 4th they cannot even see the game in the lobby if a 3rd person has joined. Really like the work done on this (haven't played since 2.4ish) way more stable, only crash we have had is if I'm viewing a allies town and they upgrade that town it tends to crash. (I'll have a few more tests before bothering with a log) but it hasn't happened since we just told each other when we were upgrading. Edited by splendorbean at 07:38, 22 Nov 2018. Creating the folder Debug/Era seem solve the "Assert violation in file" issue. But i still got some probs while running 2.7.7 with HD mod, can't change resolution and stretch filter for example (got error). 2.7.7 seem conflict with the complete edition + PATCH (mine is 2.0.1.17). The original complete edition only works fine. Edited by Squee_1 at 14:01, 25 Nov 2018.
" Failed to load angel.dll"
I installed 2.7.4 and still get the same problem. Anyone have any idea/help/solution for me ? If someone can tell me how to upload a jpeg, I will add the exact message I get. Is there any solution yet to the problem I reported ? Would love to use Safe SOD.